This topic contains 7 replies, has 4 voices, and was last updated by Margriet & Erik Theunissen 1 year, 2 months ago. My 90m of 10mm chain is stacking in my locker, such that a member of the crew has to enter the focsle, lift the cushions, remove the locker lid and flake the chain to left and right by hand as it is hauled up, to stop the pyramid of chain forming below the down pipe. Without this action it will jam every 6 metres or so coming in. This is inconvenient and could be dangerous if short handed. A plastic pipe takes the chain in a straight drop directly down from my Lofrans Tigres. Short of major joining work to redesign the front cabin, making the locker longer towards the centre of the vessel ( means cutting into the under-bunk lockers either side, which is a major job) , I can’t see how else to make it run freely. I should add that this was also a problem with a previous 60 m length of chain that came with the boat, but which I replaced due to age. I am now able to let out 90ft of chain and pull it back in without “flaking” the chain in the locker. I find if you need more than 90ft of chain out, it is best to stop at the 90 ft mark and clear an area in the locker for the pile to come. If cleared out properly the 90ft comes and goes without trouble. I have the 5/16″ BBB chain. Well seeing as we don’t live in a perfect world, I don’t worry about it too much. I find Nicolisa sails about fine with up to 40 metres of chain heaped on the foredeck. The raised scupper seems to retain it just fine, on any point of sail and within reason, sea conditions. Such is the beauty of the nic 38! When time and space allows, one then shuffles back and forth, flaking the chain within the locker as desired. I must say that I think 8 mil or five/sixteenth chain a little light, for a vessel of such a stature!! Happy anchoring. Peter and duncan. Could you maybe upload some photos of the situation on your Nic. Maybe I can use some of your ideas. would be greatly appreciated. 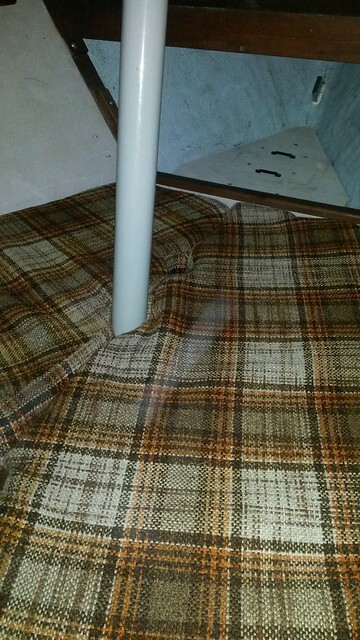 The cushions form around the new pipe location. 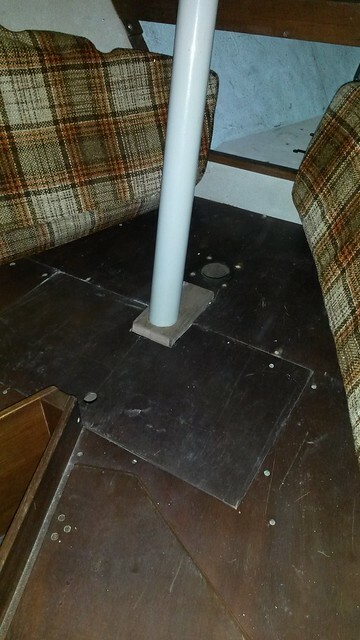 the block has a bottom that keeps the tube from falling down. 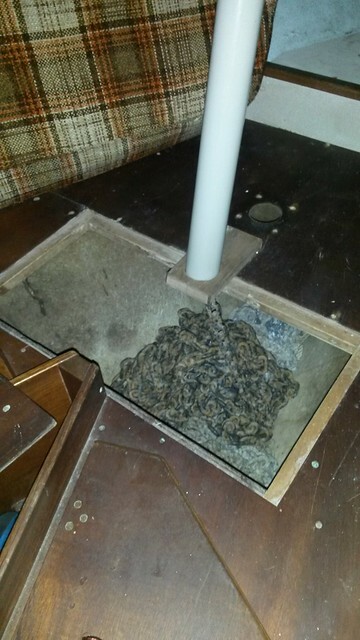 the chain then falls far enough aft to make a bigger pile before it clogs the tube. I cleared the area and pushed the rest of the chain forward and to the sides when 90 ft was out. I found that this amount can come and go many times without flaking. That is of great help, exactly what i needed. Photos tell you so much more. Our chain is currently stacked all the way up front (where you have the white triangular piece of board) I will be copying your set up. Thanks a lot.